SharePay for Healthcare Services...Working Together To Provide Affordable Quality Healthcare Close To Home! At Cabinet Peaks Medical Center, we realize that healthcare is an expensive necessity and that not everyone can afford the full cost of the care we provide. Every patient we see has their own unique financial situation, and even those that are insured may still not be able to meet their medical financial responsibilities. In an effort to better address these financial situations, we offer a financial assistance program at Cabinet Peaks Medical Center called SharePay for healthcare services. 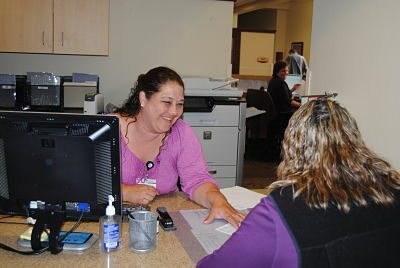 Under this program, some of our patients may qualify for discounts on the care they receive from us. The discount is based on a sliding scale, taking into account income level, debts, assets, and family size. Even if you have health insurance or belong to a Federal assistance program, you may still qualify for SharePay. NOTE: Income is defined to include all sources of household income including, but not limited to, before tax wages/earnings, social security, alimony, unemployment compensation, and investment income. Household income can also include the value of food, rent, as well as goods received inkind and from external assistance. In addition to the income levels noted above, Cabinet Peaks Medical Center will also review asset levels when determining SharePay eligibility. A single person cannot have assets exceeding $7,500, and a family's total assets cannot exceed $15,000. Asset exemptions include $150,000 in equity for the residence where a patient and the patient's family reside, and automobiles required to transport all working parties to/from work. If your total family income (income of all members of your household) is less than the guidelines, and your assets do not exceed the amounts noted above, you are eligible to apply. You must be willing to provide proof of income for each member of the household, and must also provide proof of assets. Cabinet Peaks Medical Center has Financial Resource Counselors on staff that will be happy to answer any questions you may have concerning the application process. They can be reached at (406) 283-7320. Once we have received your application, a Financial Resource Counselor will contact you for any additional information or documentation we may require. If you do not provide this information within 30 days of that contact, your application will be cancelled and you will not be eligible for the SharePay Program. You must then make payment arrangements for any outstanding amounts due to the hospital. Once we review your completed application and documentation, you will be informed via letter of your acceptance or denial into the SharePay program. NOTE: Falsification of financial information (including number of dependents) or refusal to cooperate with medical center staff will result in denial of assistance. Accounts must be in good credit standing and payment arrangements must be made with the Financial Resource Counselor. You must reapply for the SharePay program every 12 months, and are required to notify us of any change in your family's income, net worth, or insurance status, which may affect your eligibility for this program. Thank you for choosing Cabinet Peaks Medical Center for your healthcare services. Our pledge is to provide you with affordable quality healthcare close to home. We strive to provide the information you need to understand every aspect of your care, including information to help you prepare for healthcare expenses. Click here to view our patient price list. For your convenience, we provide the above price list as of 12/1/18 for some of our most common medical services. For estimates for other services not listed, to inquire about Financial Assistance Information, or for any other questions please call (406)283-7320. Your financial responsibility for these services will differ from the charges listed above based on your insurance coverage and benefits. Contact your insurance carrier to provide you with your out of pocket obligation. This estimate covers Cabinet Peaks Medical Center's charges. This estimate does not include professional fees for services such as those provided by a radiologist, pathologist, cardiologist, surgeon, or other practitioner independent of Cabinet Peaks Medical Center. In order to meet the requirements of CMS 2019 IPPS Final Rule, we have provided a chargemaster machine-readable file dated 12/20/18. Click here to view our chargemaster file. Click here to download our chargemaster file. Please feel free to contact our Financial Resource Counselor at (406)283-7320 if you have any questions about this process.